As far as the vaccines goes. Before I neutered mine I had to get the mandatory vaccines in Canada prior to the surgery. 36 hours later he stopped eating or drinking and was unwell. After couple days I took him to vet and after x-rays it showed severe intestine inflammation. First was suspected ingestion of foreign body but later ruled out. He got better after spending whooping 1500 in one day to rehydrate him and run numerous tests. Even though his reaction was postponed my vet agreed it was reaction to the vaccines. Not sure about the name, but they were one of the best on the market.Just be cautious if you own a bengal with the vaccines and make sure to get them once at a time only.As I find out later it is a better approach rather then getting few at once. However, more serious adverse events can and, rarely, do occur. Adverse events can occur as a reaction to the vaccine itself, or can occur due to the inappropriate use of a vaccine…. They don’t state what the mandatory vaccinations are. What are the mandatory vaccination for cats in Canada? I am not sure there are strictly “mandatory” vaccinations. They are probably strongly recommended by the veterinarians (for cat health and with an eye to profit). There are core and non-core vaccinations and importing pets to Canada requires a certificate of rabies vaccination or that the cat comes from a rabies free country (UK for example). It is surprisingly difficult to find information on vaccination requirements in Canada which indicates that the vaccinations are not mandatory. Perhaps Svetlana was told they are mandatory by the veterinarian. If I am wrong can someone please correct me! and of course rabies which is obligatory in North America as I understand it. 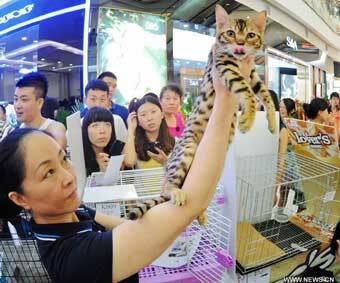 It may be the case that Bengal cats are more susceptible to vaccinations. I don’t know but it is at least possible. This entry was posted in Cat Health, vaccinations and tagged bengal cat health, cat health issues, cat vaccinations by Michael Broad. Bookmark the permalink. According to some of my readings, Canada mirrors the U.S.
in regards to pet vaccinations. The rabies vaccine is required at around 3-4 months old and boostered throughout the entire life of the animal. Only rabies is required, but vets often recommend other core and non-core vaccinations.